Head joins the heart today as Alfa Romeo announces the UK pricing and specification for the highly-anticipated Alll-New Alfa Romeo Giulia range, with prices starting from £29,180 OTR. Featuring all new rear-wheel drive architecture, perfect weight distribution, best in class power-to-weight ratios, and innovative engine and driver technologies, the All-New Giulia is every inch a true Alfa Romeo. In terms of style, the All-New Alfa Romeo Giulia stands out for its distinctive Italian design, which is expressed through an impeccable sense of proportions, based on the technical architecture, as well as the sophisticated simplicity and quality surfaces used both inside and out. In the UK, the All-New Alfa Romeo Giulia model range features five trim levels – The Giulia, Super, Tecnica, Speciale and the range topping Quadrifoglio – and is available in 13 different exterior colour options. The Alfa Romeo Giulia drivers can also choose between four engine variants (two petrol and two diesel), which are all paired to a new eight-speed automatic transmission as standard. The entry trim level ‘Giulia’ includes comprehensive standard specification. The most salient standard specification includes new efficient active safety systems, including Forward Collision Warning (FCW) with Autonomous Emergency Brake (AEB) with pedestrian recognition, Integrated Brake System (IBS), and Lane Departure Warning (LDW) – all of which have contributed to The All-New Alfa Romeo Giulia being awarded a prestigious Five Star Euro NCAP rating, with 98% protection result for adult occupants – making it the highest score ever achieved by a car, despite the more severe Euro NCAP evaluation system introduced in 2015. Rounding out the entry level trim are a host of styling and functional features. Exterior features include 16-inch alloy wheels, LED rear lights, chrome exhaust and aluminium brake calipers. As with all Alfa Romeos, the interior of the car focuses on driving satisfaction with dual-zone climate control, Alfa™ D.N.A. rotary driving mode selector, 3.5” TFT colour cluster instrument panel, UConnect™ 6.5" display infotainment system with DAB plus MP3 and Bluetooth connectivity, 8-speaker audio system,rear parking sensors and cruise control. In addition, the presence of non-invasive technology can be perceived among the instruments which surround the driver, including Giulia’s leather steering wheel which houses all main driver controls including the ignition start button. Available with the 200hp 2.0 litre turbo engine, prices for The All-New Alfa Romeo Giulia start at £29,180 OTR. The full package of standard equipment on the Alfa Romeo Giulia trim level is supplemented on the Super version with exclusive interior and exterior features. Exterior wise, Super trim level adds 17-inch alloy wheels and a dual chrome exhaust tip. Inside, Alfa Romeo Giulia Super features an 8.8-inch 3D navigation with 7-inch TFT display, as well as leather and cloth seat trims in three colour options. The engine range comprises the 200hp 2.0-litre turbo petrol, 150hp 2.2 JTDM-2 and 180hp 2.2 JTDM-2 Prices for the Super range start at £30,750 OTR for the 2.2 litre JTDM-2 150hp version. The All-New Alfa Romeo Giulia Tecnica adds useful and stylish features for the business user, including power seats, climate pack (cooled glove box, rear air vents and air quality system) and privacy glass. It also adds a driver assistance pack featuring front and rear parking sensors and rear view camera with dynamic gridlines. The engine range comprises the 2.2 litre Turbo diesel with 150hp or 180hp. Prices for the Alfa Romeo Giulia Tecnica start at £30,995 OTR for the 150hp 2.2 diesel. Building on the Super trim level, drivers wanting an even sportier presence on the road can upgrade to the Speciale trim level. From the exterior this sporty trim level features 18-inch ‘Sport’ alloys, 25W bi-Xenon headlamps, sports front and rear bumpers, a sports diffuser, dual chrome exhaust and red brake callipers. Inside the cabin, the Alfa Romeo Giulia Speciale features aluminium metal sport pedals and footrest, heated and powered front seats, heated steering wheel and leather sports seats. 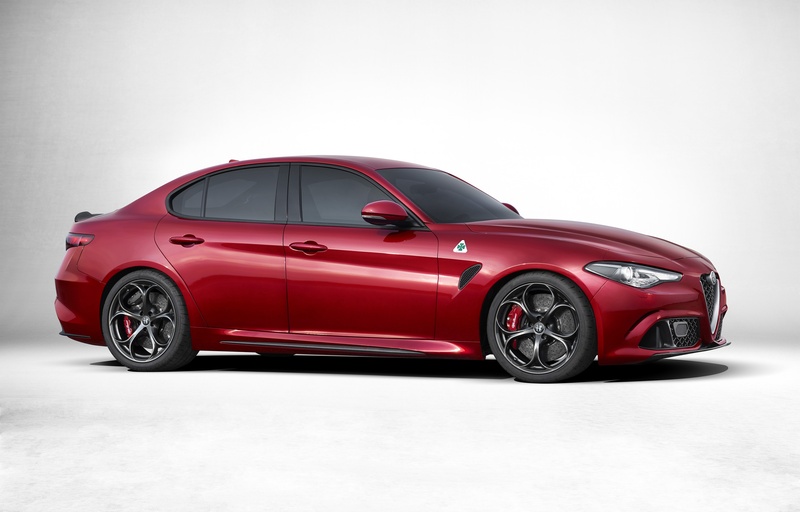 At £34,150 OTR, Alfa Romeo Giulia Speciale comes fitted with the 2.2 JTDM-2 180hp engine. The top-of-the-range Quadrifoglio trim level adds functional and styling contents to the standard specification, enhancing its sophistication and high-performance feel: these include leather and Alcantara upholstered sports seats, sports steering wheel with red ignition button, carbon fibre inserts for the interior and aerodynamic exterior spoilers, comfort and safety features that also include BSM (Blind Spot Monitoring) technology and rear camera as well as 35W Xenon headlights with AFS technology. In addition, it features technical gear designed specifically to maximise dynamic performance: the AlfaTM Active Aero Splitter system, the dedicated braking system, the AlfaTM D.N.A. Pro selector with Race mode that communicates with the AlfaTM Chassis Domain Control (CDC) system, and AlfaTM Torque Vectoring. Powered by a new 510hp, 600Nm Bi-Turbo V6 petrol engine, with an eight-speed paddle shift automatic transmission as standard, pricing for the Giulia Quadrifoglio super saloon start at £59,000 OTR. The All-New Alfa Romeo Giulia range will go on sale in the UK later this year. Full price list and technical specifications can be found below.